In order to keep your deck looking good, it’s best to periodically clean it. Whether you have a deck constructed of cedar, redwood, pine or pressure treated wood, or you have an exotic hardwood deck, following these easy steps will help you keep it looking great. Messmer’s Wood & Deck Brightener (Part B) For redwoods, some cedars and ipe. Do not begin the process until you have read and understand all instructions. If you have questions, call us toll free at 1-800-731-3669, weekdays 8-5 Mountain time. Sweep excess debris (dirt and leaves) off the deck. Dissolve Wood & Deck Claner (Part A) in warm water at the recommended strength. After waiting for several minutes for product to dissolve and activate, apply with a mop or sprayer. Let the product sit on the deck surface for 10-15 minutes, making sure to keep the deck wet with more product if it begins to dry out. Scrub the deck boards with the grain of the wood. Rinse thoroughly with clean water. Allow the deck to dry for at least a day or two in good weather before applying any stain or finish. Sweep excess debris (dirt and leaves) off the deck. Wet the deck surface down with clean water from the hose. Dissolve Wood & Deck Cleaner (Part A) in warm water at the recommended strength. After waiting for several minutes for product to dissolve and activate, apply with a mop or sprayer. Let the product sit on the deck surface for at least 10 minutes, making sure to keep the deck wet with more product if it begins to dry out. Scrub the deck boards with the grain of the wood, then rinse thoroughly with clean water. Mix Wood and Deck Brightener in warm water according to label directions. Apply to the wet wood previously cleaned by Wood and Deck Cleaner. Allow the Brightener to sit on the surface for 10 minutes, keeping the deck wet with more product if necessary. Rinse thoroughly with clean water. Allow the deck to dry at least a day or two in good weather before applying any stain or finish. Sweep excess debris (dirt and leaves) off the deck. Wet the deck surface down with clean water from the hose. 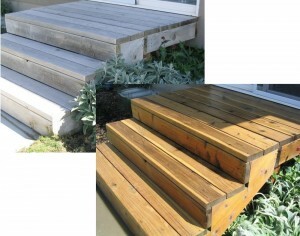 Mix Wood & Deck Renewer / Brightener (liquid concentrate) according to label directions. One gallon of concentrate makes up to five gallons of solution, mix stronger (less water) for tougher jobs. Apply mixed product with mop or sprayer, and allow to sit on the deck for 15 minutes, keeping the deck wet with more product if necessary. Scrub the deck boards with the grain of the wood. Rinse thoroughly with clean water, and allow the deck to dry for at least a day in good weather before applying any stain or finish. Q: Why is it important to clean before applying UV Plus to a deck? A: If you apply UV Plus to a dirty wood surface, the wood will go dark and dingy. The oils and resins in the UV Plus will entrap the dirt and make it impossible to clean until the product wears away with the top surface of the wood. By cleaning the wood with a good quality wood cleaner like Messmer’s Wood and Deck Part A, or Wood and Deck Liquid, you are properly preparing the deck for staining with UV Plus. Q: Are your products hazardous to people and animals or to plants? A: When used in accordance with label instructions, all of our products are safe to use. As with any cleaning chemicals, keep them out of the reach of children and away from pets. It’s always best to wet down the lawn and vegetation area around your project, and rinse thoroughly afterward to dilute any cleaning products you may use. We also suggest covering sensitive plants to minimize contact with any cleaning chemicals. Q: How do I decide which product(s) to use on my deck? A: The powder products are the most powerful and the best choice for tough jobs. For redwood and cedar decks, use either the powder cleaner and brightener in that order, or use just the liquid product alone. On some types of wood, the brightener and liquid renewer / brightener are not as effective and will not change the look of the wood. Use the powder cleaner alone on hardwood, pressure treated, and pine decks. All exterior surfaces collect dirt, dust and contaminants. It is necessary to clean them periodically to keep them looking good. We suggest using Messmer’s cleaning and/or brightening products at least twice a year for periodic maintenance cleaning. In addition to maintenance cleaning and brightening, it is important to clean and brighten before applying any UV Plus wood stain, or any other wood finish. Cleaning the deck surface before applying finishing products insures a clean, beautiful look that’s not dingy or gray.